On July 20, at approximately 3:00 p.m., Paulina, a Comic-Con employee wearing a lime green shirt, said that she witnessed “10 red lights” in the last five hours during her watch. She is one of the first employees at the convention who will greet you upon entering the glass doors and the scanners (where a badge must be scanned along one of the four-foot pillars). “If there were no errors and no one in front of me, it was fine. But there was definitely bottlenecking with even a few people,” posted one visitor on social media. Clark used to dress in costume and buy the used passes on the sidewalks, then he would immediately sell them for more money to another passing by. “They never checked IDs before,” he said. “And in the past,” Paulina said, “people would be like ‘[first] all five of us will go in and [then] gimme four of your badges, and I’ll take em out for everyone else [to go inside]. “Now imagine that [5-in-4-out system] done 10-20 times over,” Clark said. “It’s made it a better experience for a lot of people because it’s not so overpopulated, and you can actually walk around and not get trampled on,” Paulina said. In the last few years, Comic-Con has drawn over 130,000 visitors (inside the venue). But as of lately, there are spectacles outside that draw many visitors. A few of the visitors on the outside by the IMDb yacht were waiting for an autograph or selfie with Kevin Smith who was filming inside. One dressed in a Wonder Woman outfit said, “I bought passes on Craigslist before, but then it got too expensive, plus [nowadays] there’s a lot to see here [by the water] and across the street [at Gaslamp].”. 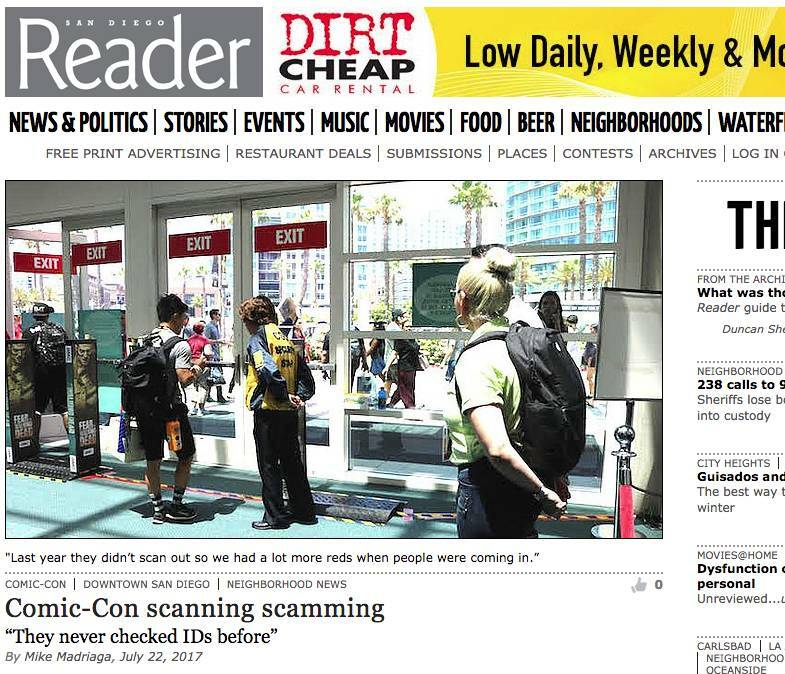 Before, some Comic-Con scammers photoshopped their badges with different colors to convert their passes from one-dayers to four-dayers, so then Comic-Con implemented hologram stickers (which are no longer used) to combat that. 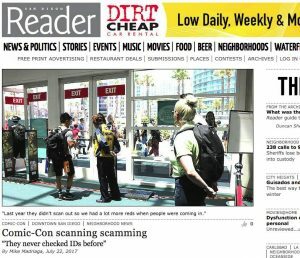 In the past few Comic-Cons, security would allegedly quarantine groups of people inside the show, and ask for IDs to match the badges; in the last couple of days, no reports were made regarding this type of security enforcement. Then there are those Comic-Conners who are shameless. “I asked ‘is it your friend’s badge?’ and they answered ‘yeah,’” Paulina said, “I’m like ‘ok you’re not allowed to use it’ so then the security guard will walk him over to the RFID help desk and they kinda police it.